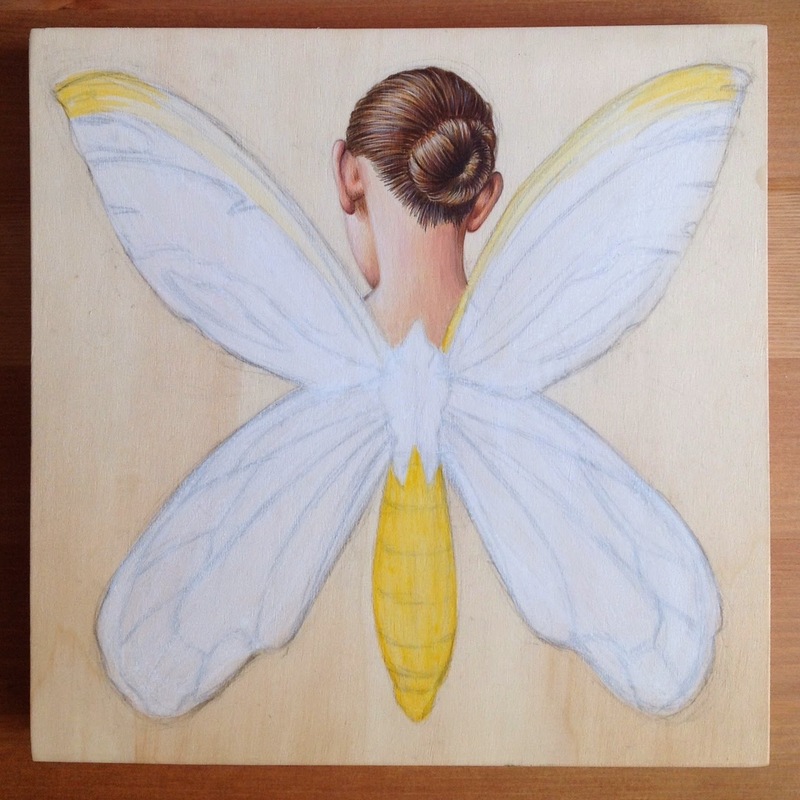 Pictured below are some early stages of my first work for 2015: Queen Alexandra’s Birdwinged Woman. 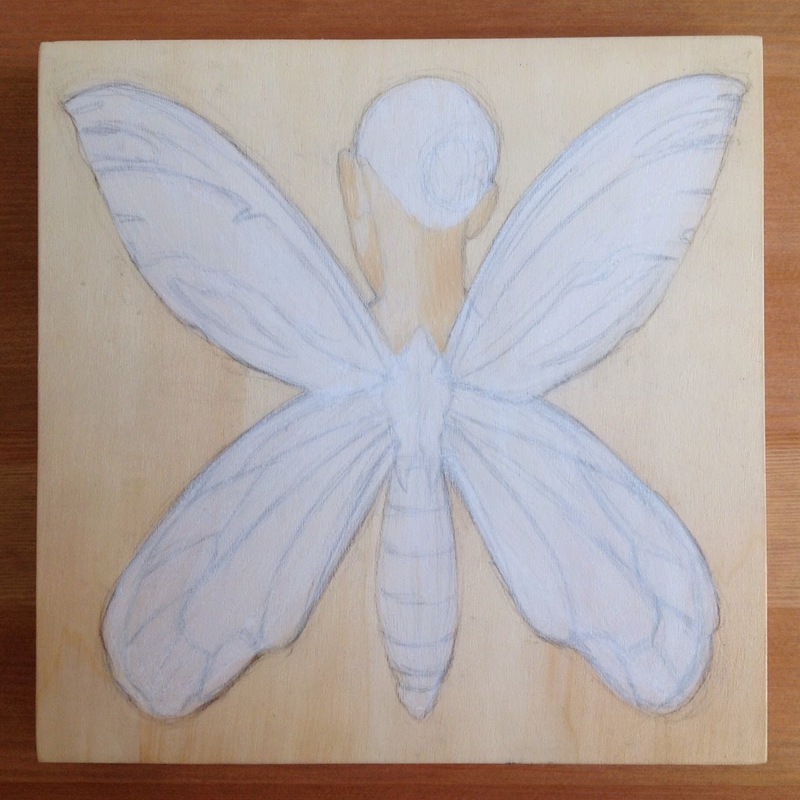 The 20 x 20 cm wooden panel has been sized in order to protect it and prevent darkening - its subtly grained surface will provide the background to the image. The figure was outlined in pencil. It was then painted over with a couple of light coats of gesso, through which these guidelines remain visible. An area of detail has already been added: I concentrated on the subject’s skin and hair, mainly to get a feel for the medium. 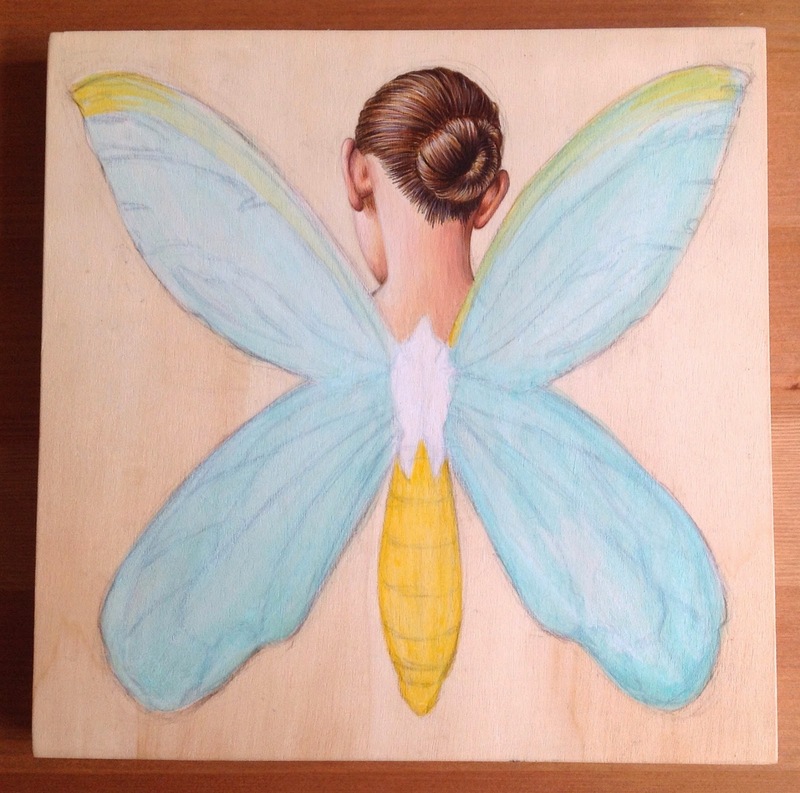 I've painted on wood before, but have never worked in quite this way. 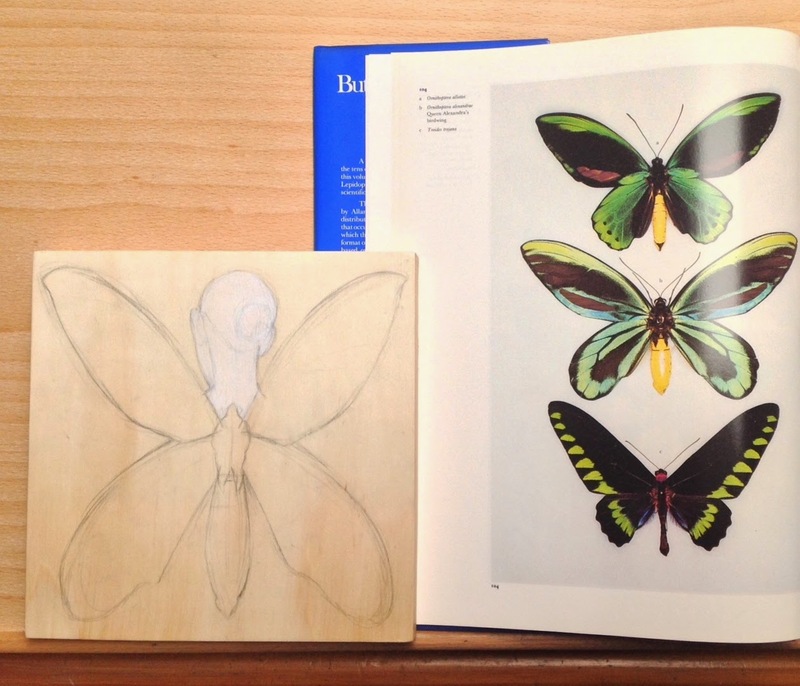 The remainder of the image will be built up via a series of thin layers, to which further details, notably the markings on the butterfly's wings, will be added. 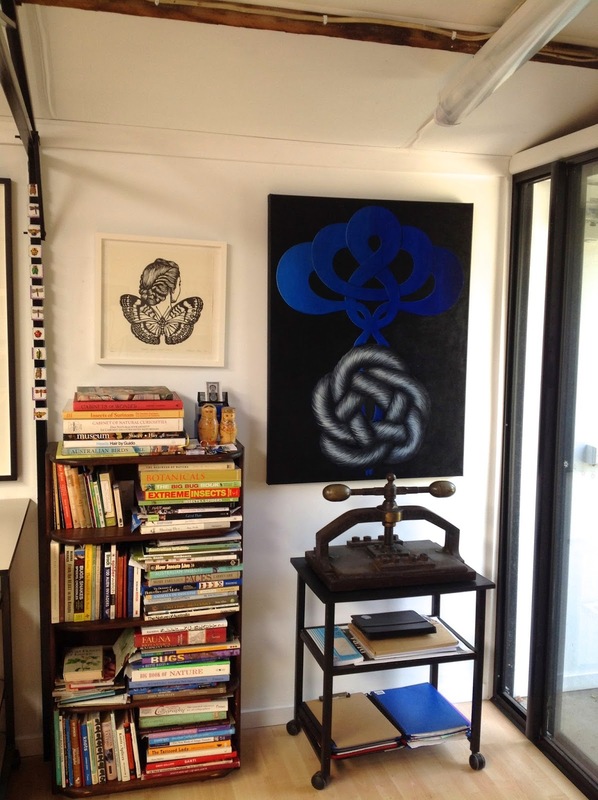 As the first month of 2015 nears its end, my principal focus remains on the Ballarat studio: further personalising the space and surrounding myself with as much essential reference material as possible before beginning the next phase of my work. 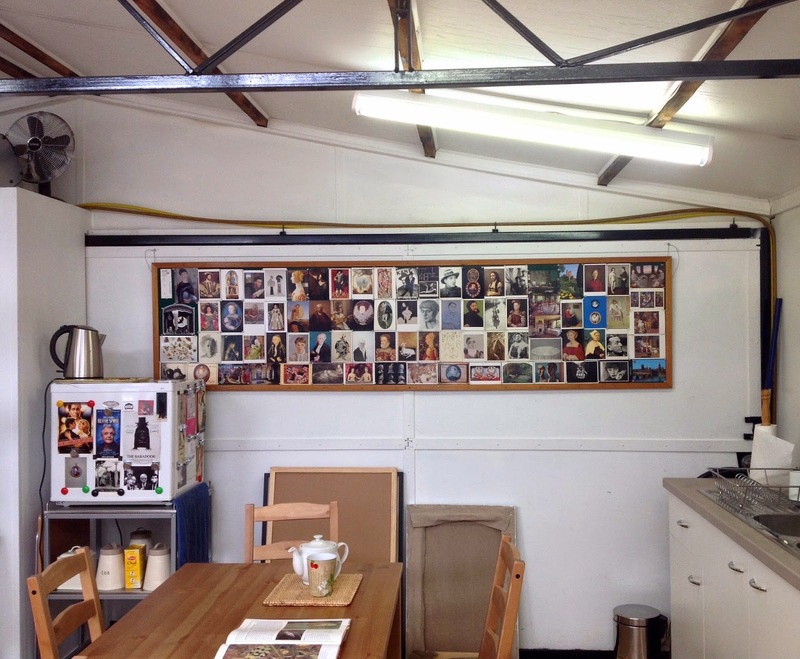 The final undertaking – at least, for now – has involved gathering together the majority of my enormous postcard collection and making a selection for the large noticeboard that hangs in the kitchen area of the studio. For many artists, postcards provide vital and affordable lifelines to the original artworks. My own postcards have been compiled over a period of over thirty years, mainly from museums in Europe, but also the US and Australia. There are some cards that will always make the cut (for example, the postcard of Orson Welles) and even if the same reproductions aren’t included, there are numerous artists (among them, David Hockney, Rembrandt, Nicholas Hilliard, William Larkin, Hans Holbein, Rogier van der Weyden, Gwen John, Paula Rego, Max Beckmann, Lucas Cranach the Younger, Lucian Freud, Kate Bunce, Stanley Spencer, Piero della Francesca, Käthe Kollwitz, Rene Magritte, Jean and Francois Clouet) whose work will always have a place in my Personal Pantheon. 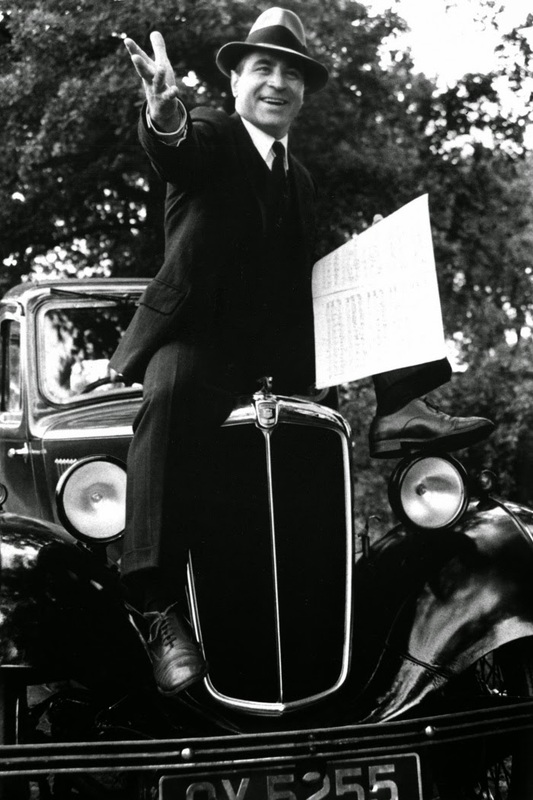 Aside from Orson Welles, the performing arts are currently represented by a select number of individuals including Noel Coward, Charles Laughton, Lotte Lenya, Coral Browne, Fritz Lang, Jean Cocteau, Georges Melies and Sergei Einstein. Like many of us, I’ve long been fascinated by the spaces of creative people. Two of my personal favourites feature in the collection: Monks House, the home of Leonard and Virginia Woolf, and Vita-Sackville West’s writing room and garden at Sissinghurst. (Details of each as provided on verso of postcards). Most of these paintings have a similar aesthetic to the work I was making at the time; some, if not all, are still resonant. The derogatory term “chocolate box” has often been levelled at Renoir, but he’s been responsible for some splendid works, including the unassuming little masterpiece pictured above. 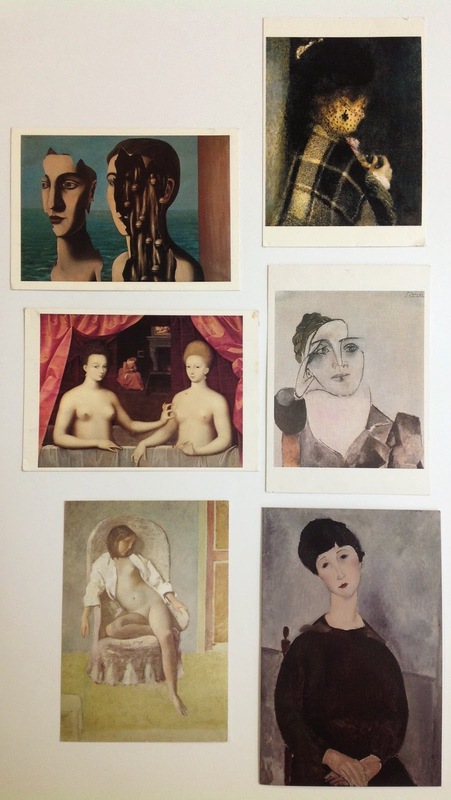 Of these six works, the Modigliani is the one of which I remain fondest. Residents of the Cité are given a free pass to the museums of Paris. I visited the superb Picasso Museum many times, on some occasions just to see that portrait. When I was sorting through the two boxes in which most of my postcard collection is stored, I also found some old photographs. One was of an oil pastel drawing, a kind of stylized self-portrait (present whereabouts unknown) that was made during the Paris residency. It’s reproduced below. Unfortunately it’s a reproduction of a reproduction that isn’t very good to begin with. It’s included here because the postcards in question can be seen in the background. 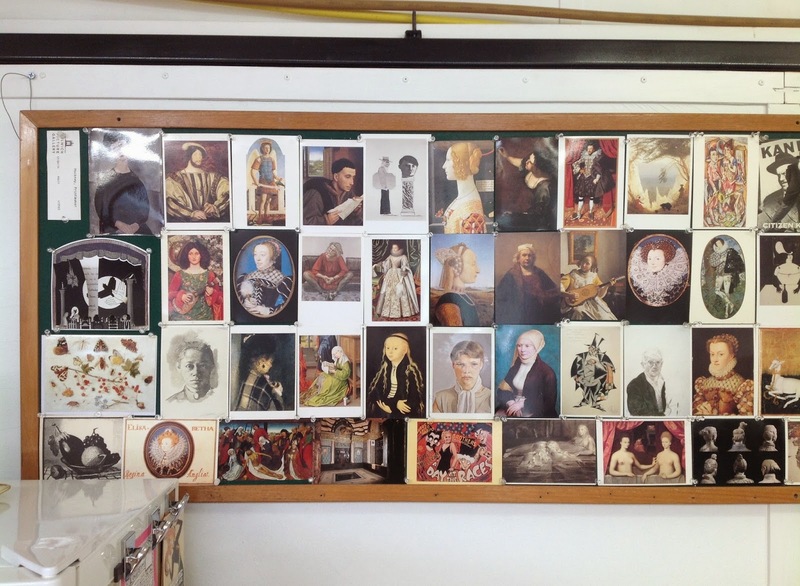 Like my Ballarat studio, the noticeboard display is expected to constantly evolve. Meanwhile, at this point in time, they are both pretty well where I need them to be. A project that consumed a substantial chunk of time over the Christmas break was the rearrangement of my collection of hair ornaments. Some are Spanish peinetas; others are of Asian origin. The majority are western, dating from the early twentieth century onwards. Many were sourced in antique markets; several contemporary hairpins were discovered at Camden Lock Market in London. 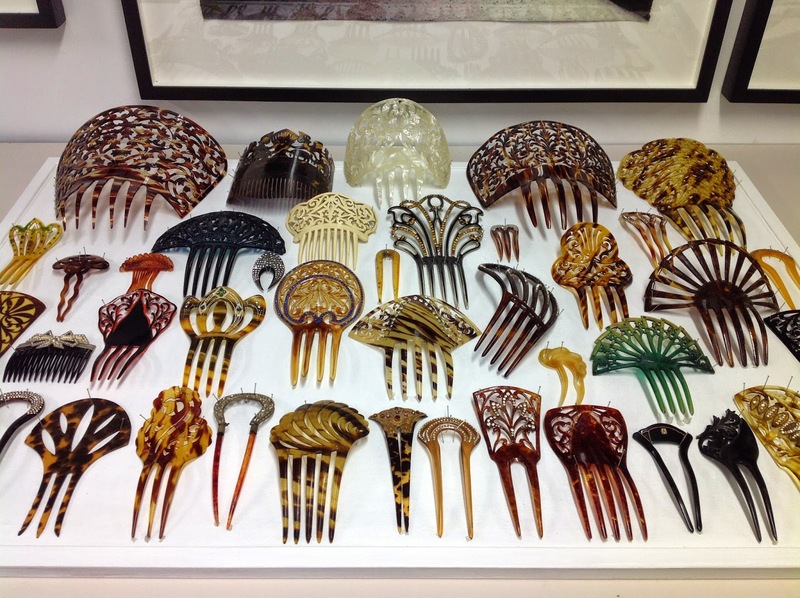 I'm also fortunate to have received some exquisite ornamental combs as gifts. 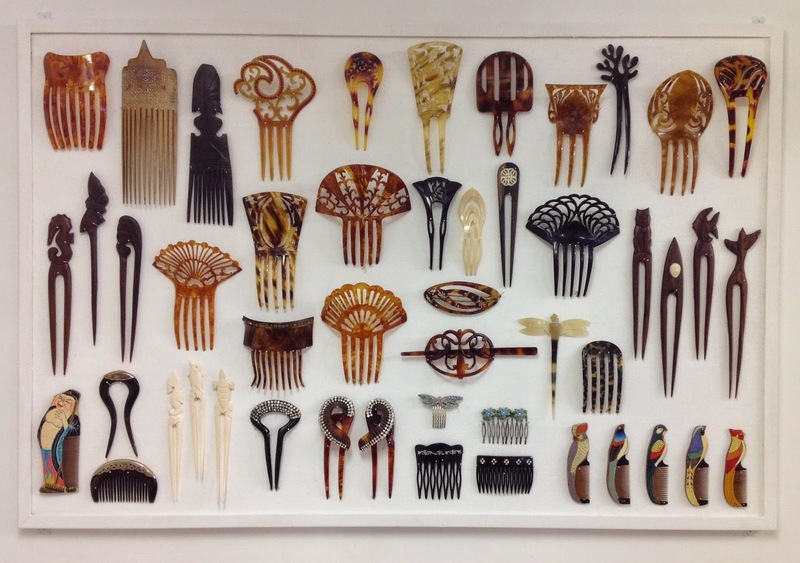 A sizeable number of combs and pins were the basis for particular works in the Hair Ornaments series, exhibited at Charles Nodrum Gallery, Melbourne in the exhibitions Tease (2004) and Forget Me Knots (2007). A handful also served as models for individual works in the installation Iron Butterflies, which featured in the group exhibition The Body at RMIT Project Space, Melbourne (2007) curated by Dr. Richard Harding. The hair ornaments were originally displayed en masse in a studio I briefly occupied in our place at Abbotsford; it's since become my partner Shane’s workspace. After I bought the house at Ballarat, selected jewels from my modest collection were pinned to a notice board intended to cover a singularly ugly 1970s air conditioning unit in the living room. During the past week I painted the pin board a vibrant white; the hair ornaments are now shown to far greater advantage. This prompted me to acquire and paint a second notice board for the studio, to which the remainder of the collection is now attached. 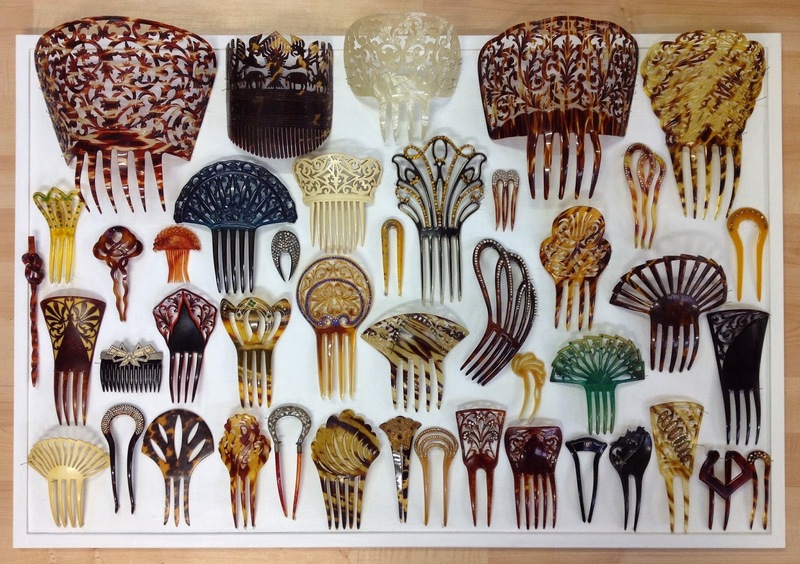 By and large, the end of my comb collecting days coincided with a change of direction in the work. In recent years, however, I’ve acquired several additional examples, including the hand painted wooden birds from China (see studio notice board below, bottom right) which I am now able to display for the first time. If combs ever make a return appearance in my imagery, it will most likely be prompted by these distinctive specimens, which also draw their inspiration directly from the natural world. Red Comb #3, 2004, oil pastel on paper, 75x56.5cm. Private Collection. 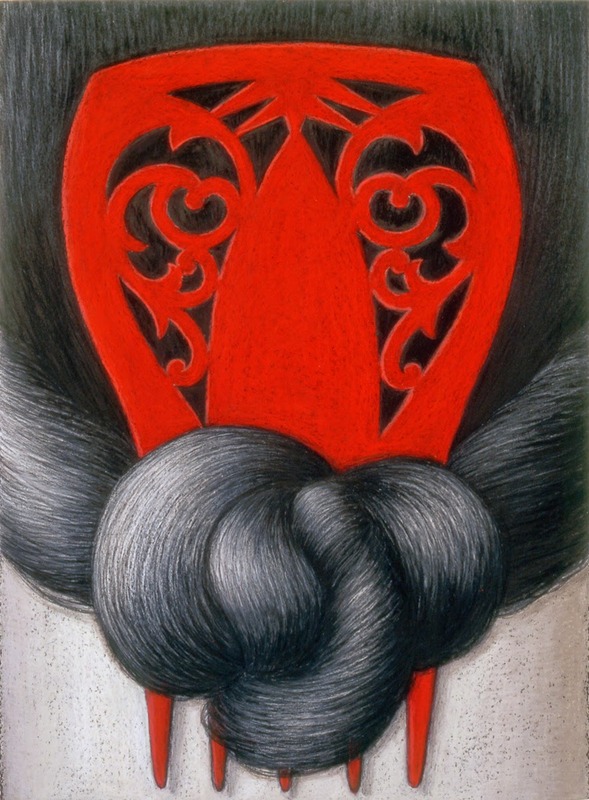 Red Comb #5, 2004, oil pastel on paper, 75.5x56.5cm. Private Collection. 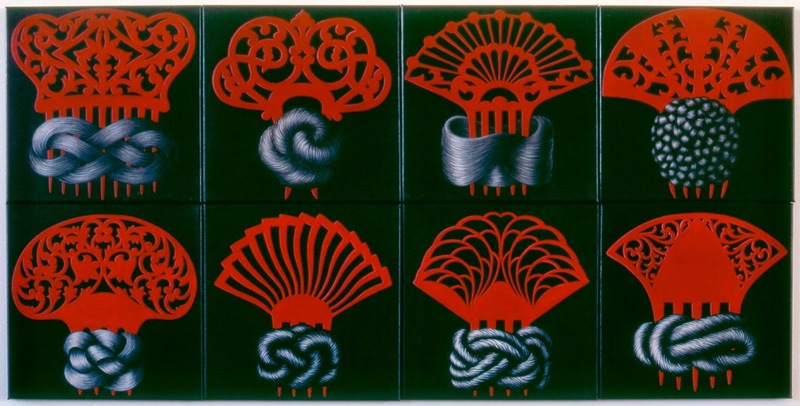 Eight Women, 2005, acrylic on canvas (8 panels) 60x120cm (overall). Collection: the artist. 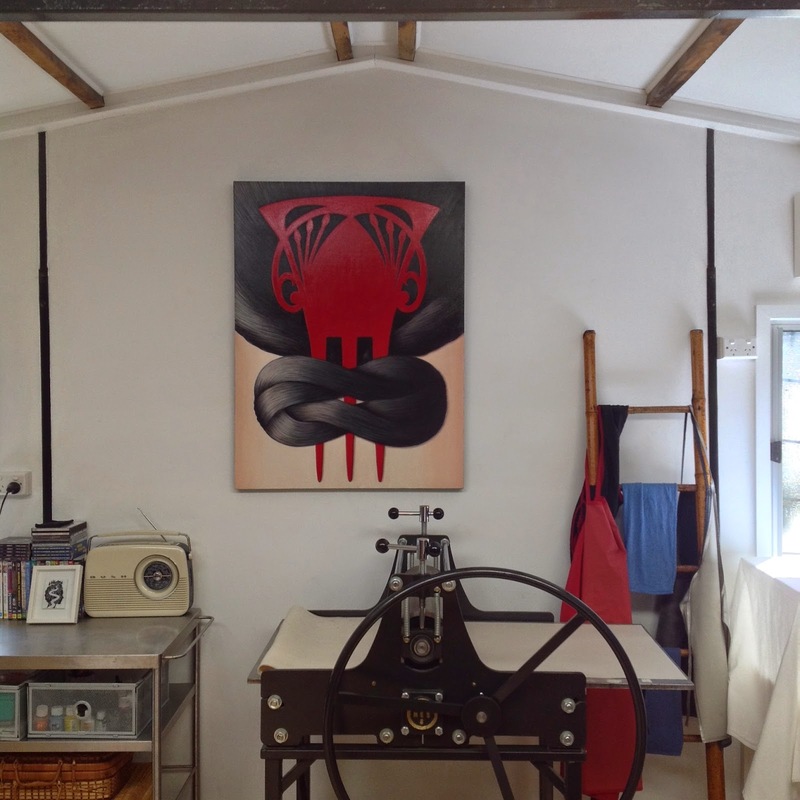 Iron Butterflies, 2007, RMIT Project Space (installation view), cut-out linocuts, dimensions variable. The quiet that follows directly after Christmas and New Year is a time I particularly relish. Many people are away and numerous institutions are closed, so with fewer frustrating interruptions on their part and only a modicum of guilt on mine, I give myself permission to take time out to read, recreate, reflect, recollect, reconnect, rest, refresh and recharge. I’ve been giving a great deal of thought to the studio at Ballarat, the first stage of which was completed less than a year ago. Once the rudimentary furniture and equipment were in place, I was able to start work right away, something I’ve never before experienced with a new workspace, where it can take considerable time to settle in and establish something resembling a working routine. 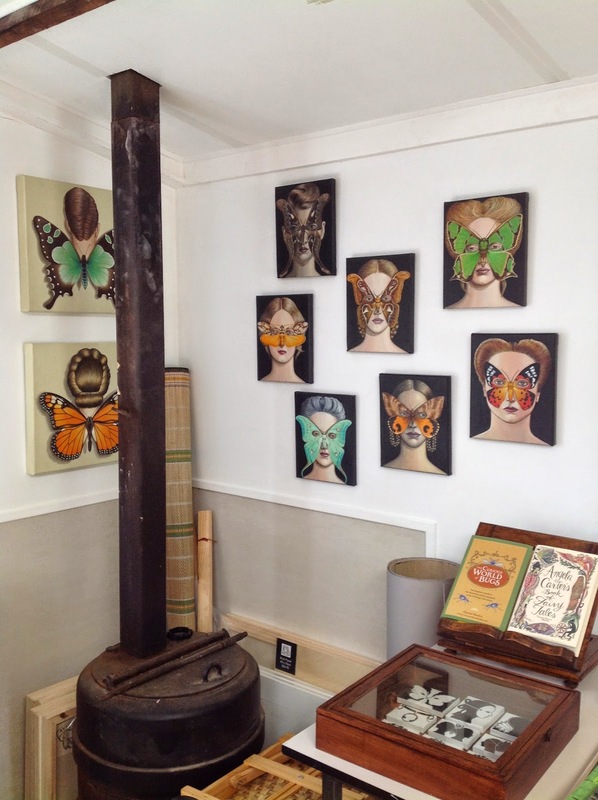 Although a handful of my works hung in the space, the walls remained relatively unadorned. Lately, however, specific projects spanning the next couple of years are very much on my mind. Before I set off in new directions, I must first get my bearings. Principally this involves reconnecting with selected key works, and the best way to do this is to have them around me. Consequently, we have just done a major hang. Particular works may be familiar, but collectively the work has never been configured in this way, enabling me to see it in a fresh light. Moreover, the space feels far more my own than it did before, surely a solid basis for starting a New Year and new work. Next week everything will be pretty well back to normal. The hiatus was all too brief, but it feels like the groundwork for my journey has been firmly laid. In the meantime, in between time, here is the story so far. 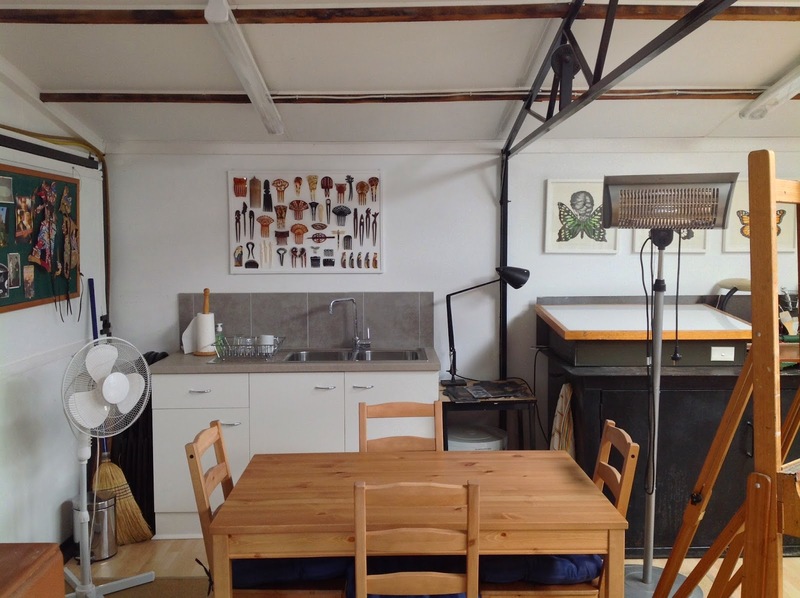 The studio was originally a substantial garage. Its conversion was drawn-out because we were constantly juggling it with other areas of our lives, most notably work commitments. Aside from plumbing and wiring, Shane did most of the work, thus saving me thousands of dollars. The following three photographs were taken when the process of insulating the walls and ceiling was well under way. On the afternoon the transformation was finally achieved, we celebrated with a glass of bubbly. Belying the photos directly above, the "finished" studio was a tranquil, light-filled space. It had such a good feel, we didn’t want to leave, and ended up having our evening meal there. The remaining photographs (including the one that heads this post) were taken last week. They aim to give an idea of the studio as it is now. From the viewpoint of the first day of a brand new year, I look back on more personal highlights (and a few sad moments) from 2014. In most cases Elsewhere refers to London and outlying areas, for example East Sussex, location of Farley Farm House. AKA Home of the Surrealists, it was in fact the home of photographer Lee Miller and her artist husband Roland Penrose. 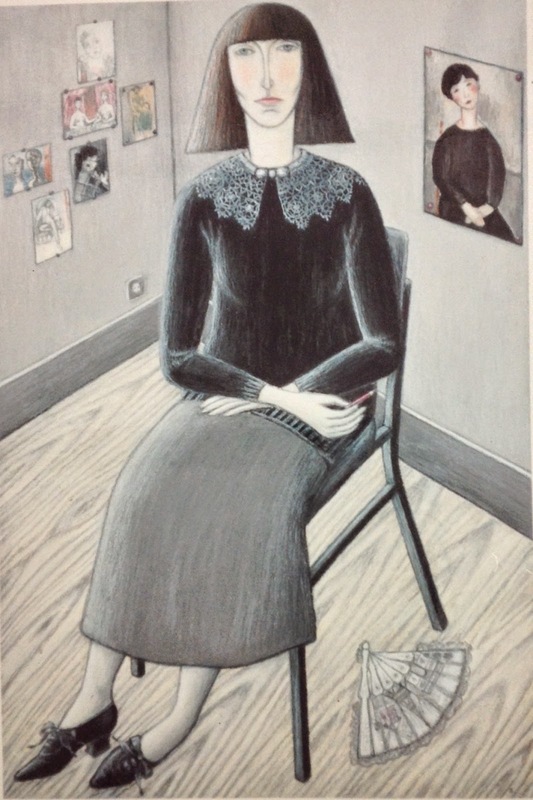 Among their many houseguests were Pablo Picasso, Max Ernst, Richard Hamilton, Eileen Agar, and Antoni Tapies. The house, which is maintained much as it was when its owners were alive, contains a fine collection of artwork, not only by Miller and Penrose, but also by many of its distinguished guests. There is also an extensive sculpture garden, which overlooks the glorious South Downs. garden at Farley Farmouse. The sculpture is by Antony Penrose. Remaining photos:interior and exterior views of the house and garden. Pictured bottom right: DK outside the farmhouse. For the second year running, one of the year’s high spots was provided by Dame Angela Lansbury. As good fortune would have it, our visit to London coincided with her triumphant appearance as the delightfully batty spiritualist Madame Arcati, in Noel Coward’s play Blithe Spirit. 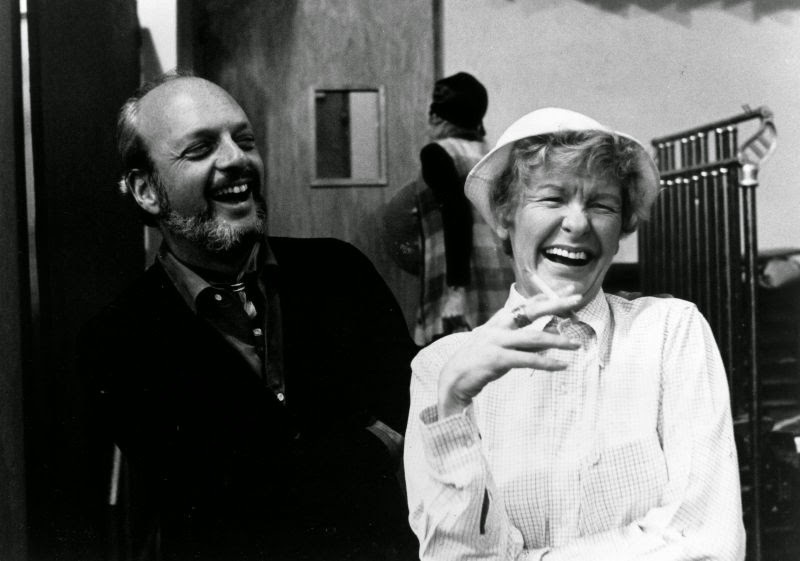 The play’s director was Australian-born Michael Blakemore (seen below, bottom left, with Angela Lansbury). 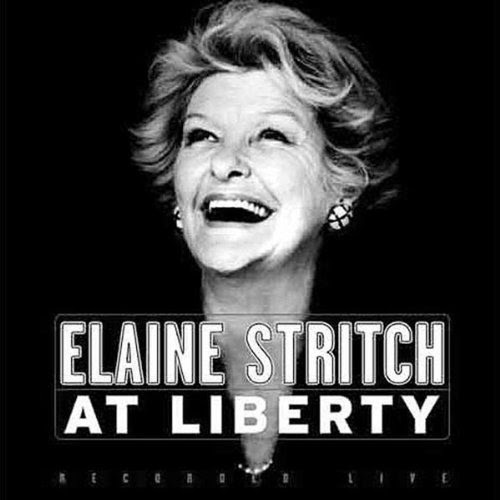 Through the years, I’ve seen extremely fortunate to see other productions by him. Simply stated, they stand tall amongst the finest theatre I’ve ever seen: The Front Page, 1972, Long Day’s Journey into Night (starring Lawrence Olivier) 1972 and City of Angels, 1990. Like these productions, Blithe Spirit was gorgeous to look at, with a meticulous but affectionate feel for period. This production was distinguished by a singular a decorative touch that was probably lost on most of the audience: the walls of the elegant set were hung entirely with the works of Australian Modernists, predominantly Margaret Preston. Our London stays wouldn’t be complete without a walk on Hampstead Heath and at least one visit to Kenwood House. Noted not for the first time on this blog, much as we admire certain works in the collection (NOT the ghastly paintings of children, but including, among others, the Bols, pictured below, bottom left, the Vermeer, bottom right to the left of Shane and one of the finest of all Rembrandt’s self portraits) our favourite works remain the magnificent William Larkin portraits (pictured below, top left and right). But it’s also friends who make our visits to the UK so special. Unfortunately Shane and I both caught flu, which impeded severely on our travel plans, so we were unable to reconnect with friends outside of London. Still, we soldiered on as best we could, and managed to spend quality time with some of our oldest friends, including Barbara Britton, Sue Verney, and Roger and Bev Murray. Later this year we were doubly blessed, as back in Australia we had visits from both Sue and Bev. The collage below contains more highlights, some from the UK, others closer to home. 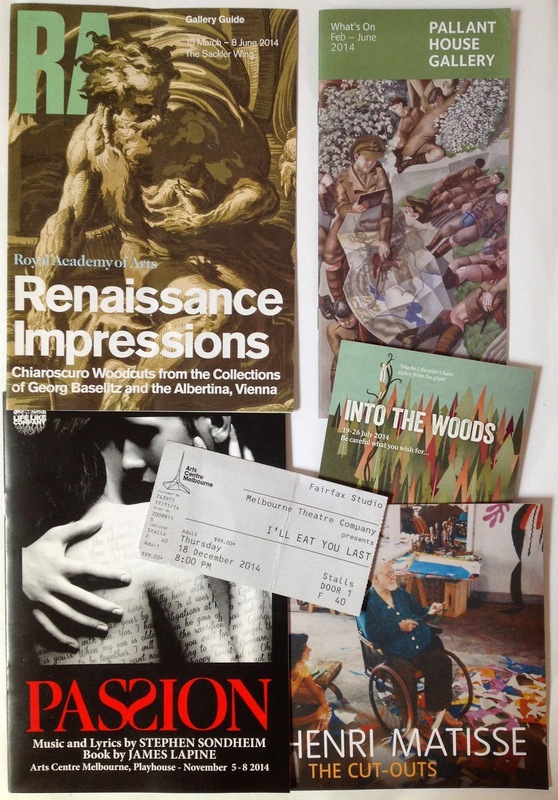 Top left: the flyer for Renaissance Impressions Chiaroscuro Woodcuts from the Collections of George Baselitz and the Albertina, Vienna, which we saw at the Royal Acadamy. 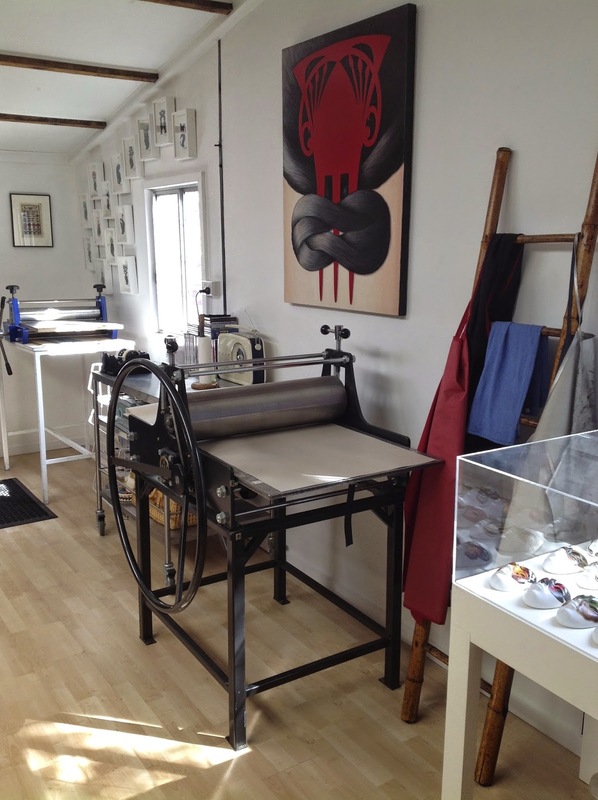 A stunning show, a must-see for relief printmakers. Shane and I have fond memories of the day Sue, Barbara and I spent in Chichester, where we visited Pallant House Gallery. Its permanent collection is remarkable; however our main focus was the exhibition Stanley Spencer: Heaven in a Hell of War. Timed to coincide with the centenary of the First World War, the exhibition featured his famous cycle of murals from Sandham Memorial Chapel in Burghclere, Hampshire. Henri Mattisse The Cut-Outs at Tate Modern opened towards the end of our stay. Shane had more or less recovered by then, but I was still quite ill. Nevertheless, we managed to get ourselves to this dazzling show, which if while didn’t cure the flu, at least managed to raise my spirits. 2014 gave Shane and I a veritable Stephen Sondheim feast. Back in July, Victorian Opera showed yet again how brilliantly they perform his work with their scintillating production of Into the Woods. (I can hardly wait for their Sweeney Todd in 2015). In October, Shane and I were treated to an exemplary production of Sondheim’s rarely performed (at least in this country) Assassins, directed by Tyran Parke. Then in November we were profoundly moved by Lifelike Company’s production of Sondheim’s Passion, performed for the first time in Australia, and featuring a handful of the cast members from Assassins. The last play we saw this year was also a bobby dazzler: the Melbourne Theatre Company’s production of I’ll Eat You Last, with the one and only Miriam Margoyles. Shane, who adored it as much I did, has written about it on his blog. To read his post, click HERE. 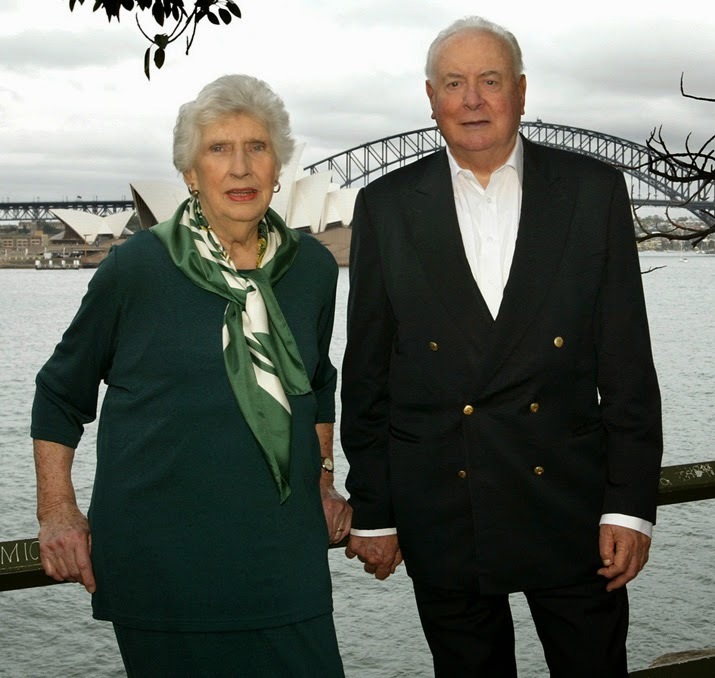 2014 was also the year we lost our former Prime Minister, Gough Whitlam (pictured below with his wife, the late Margaret Whitlam). 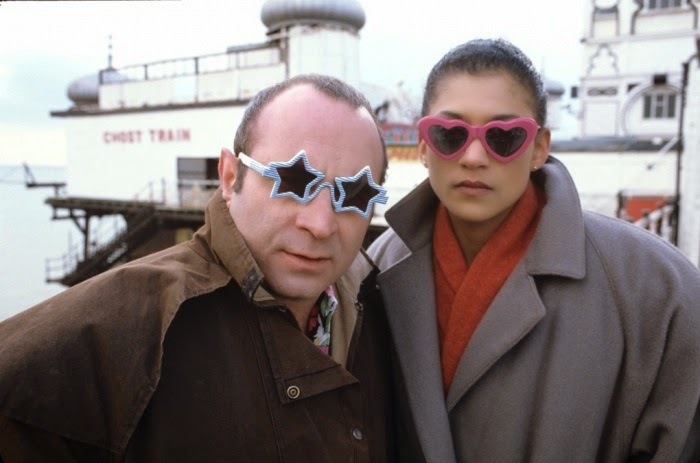 I was also saddened at the passing of two of my favourite actors: Bob Hoskins and Elaine Stritch. In a year where we lost some real greats, some far too early, for me personally the death of these was felt keenest. It’s extraordinary how someone you’ve long admired but have never met, and who never even knew of your existence, can still play such a big part in your life. I still can’t believe the incredible life force of these extraordinary talents has been extinguished. 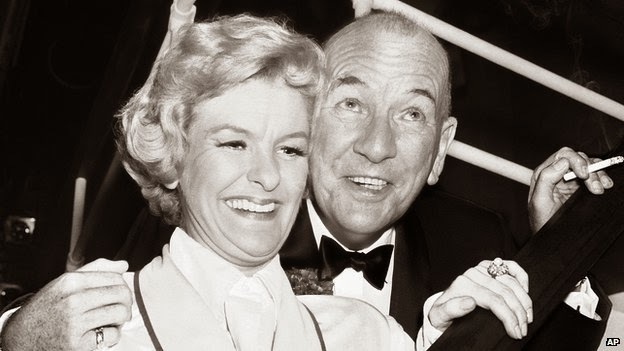 Vale Bob Hoskins, Elaine Stritch and Gough Whitlam.